Kampot, 캄보디아의 몽키 리퍼블릭 | 호스텔월드에서 예약하세요. 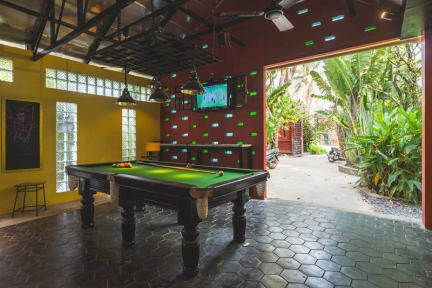 Monkey Republic is located in Kampot City Centre in what is known as guesthouse street. It is only a 5-minute walk to the river but then nothing is a long walk in Kampot. What's more, it is just off the Salt Workers roundabout and close to the Acleda bank. DORMS Monkey Republic has 9 dorms on offer, each one equipped with modern air conditioners. The dorm beds each have their own light, power point, and curtain. Under the beds, there are steel lockers large enough to fit an entire backpack. There is a private bathroom for every four beds so there should be no need for lining up in the morning. PRIVATE ROOMS Monkey Republic has a number of private rooms all with private bathrooms. All of our private rooms are Fan Cooled, we do not have Aircon private rooms. The fully-stocked bar-restaurant has super fast Wi-Fi and a range of seating options. It offers a food menu with Khmer favorites and Western comfort food, including a wide choice of vegetarian options. A generous distribution of power outlets to charge your gadgets. You can set-up your computer in one of our booths or re-purposed cable reel tables. Play pool or watch sports at our new lounge or hang out on our outdoor terrace with a cold beer on the community seating. Upstairs, there's a chill-out lounge with the original 1960s stained glass windows that filter Cambodia's equatorial sunlight and a veranda overlooking the property. 1. Check-in Time: from 12.30pm. 2. Check-out Time: until 11:00am. 3. Payment: Cash (USD) only upon arrival. 4. Cancellation Policy: At least 2 days advance notice before the arrival date is required. 5. Reception Hours: from 7 am until 11 pm but there is overnight security during the remaining hours. 6. The bar/restaurant is open at 7 am and closed at 11 pm. 7. While Monkey Republic is a family-friendly establishment, we don't allow families to stay in the dorm.